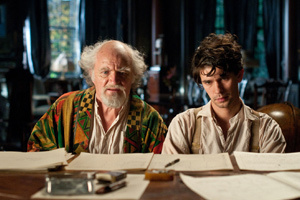 Sitting through three hours of Cloud Atlas, I was struggling to take it seriously. Buzz from Toronto, respectful news of its giant budget, and the collaboration between crowd-pleasing Wachowskis and stylish fatalist Tom Tykwer had built it up. But the pounds of makeup and shallow philosophy on screen bring it down. Six stories intertwine. 1) An English lawyer goes on an errand at sea during the days of slave trade. 2) Two young gay lovers correspond in 1930s Europe, one goes off to help a great composer with his last work and to begin composing his own. 3) A reporter uncovers unethical and dangerous practices at a nuclear facility in 1970s San Francisco. 4) A book editor in 2012 is comically imprisoned in an assisted-living home by his brother. 5) A server clone in Neo Seoul 150 years hence gets help escaping; she becomes an advocate for human rights. 6) A tribal castaway is visited by an advanced archaeologist looking for access to his people’s sacred sites. Phew! Tykwer directs the three segments closest to our own time. The Wachowskis direct the future and the distant past. The stories are cross-cut. They don’t necessarily tell the same story, not even thematically — although each story seems to have a lot of chasing and escaping. Cloud Atlas ’ editing is well done. Emotionally similar scenes in one timeline are cut with scenes from another timeline. But editor Alexander Berner (was this his dream job?) doesn’t slavishly follow any rules. It doesn’t matter whether all six threads come together at the same time, as long as two or three do. The union of stories is justified through Fate and reincarnation. A man saved by the reporter’s father says “If your father hadn’t done what he’d done, I wouldn’t be here,” to which she replies “that makes 2 of us.” The Korean advocate says that we are part of something bigger, a story that began before us and continues after us. This in turn justifies the extensive reuse of actors in each segment. Each actor plays up to 6 parts. Tom Hanks is maybe always a bit of a hustler, but his hard edge softens in each later story. Hugo Weaving plays a Bad Man in all his incarnations. Jim Stugess, Ben Whishaw, and Halle Berry take turns as protagonists and helpers. Doona Bae has a prominent role in the Korean timeline and smaller parts in three others. The cross-cultural makeup (Europeans and Africans as Asians, and vice-versa) is not convincing. In Korea, Weaving looks more like a Klingon/Vulcan from the original Star Trek series than a genuine Korean. Going the other direction is no better; Bae’s European makeup takes her into the uncanny valley of robots. At least the makeup gives audiences something to do when the film loses steam: sit in your seat and play the “who’s under that makeup” game? Afterwards, I found out that the novel on which the movie was based was meant to be playful and fun, using many styles from different genres. Only then did I realize the movie isn’t supposed to be serious, but rather a pulpy adventure with only enough “philosophy” to justify the mash-up. I think I would I have enjoyed Cloud Atlas more had I taken it less seriously.